Yes, we are FINALLY home! Sorry it's been a few days; but in my defence, it has been a daunting few consisting of diaper rash and juggling medications. 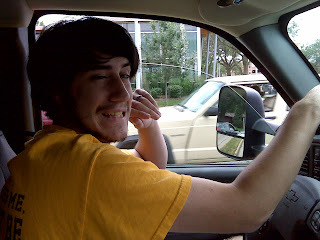 Here is a picture of dad driving us home from the hospital- yes, I know he is cheesy. He NEVER smiles nice for me. This is Jim, Kevin's dad, one of the other loves of my life. He always gives me (and his granddaughters, of course) a reason to smile and laugh. I know he hates this picture, and I will probably catch hell for posting it, but I LOVE it because of what is going on. He is laughing because Charlie is grinning at him- and everytime he swooped his head down to munch on her belly, she laughed and tried to grab his hair. This is Kathy, Kevin's mom, one of the mother hens in my life. She doesn't care who's kids are who's, they are ALL hers. She will do anything for any of her kids and grandkids, and being a grandma is one of the greatest joys in her life. 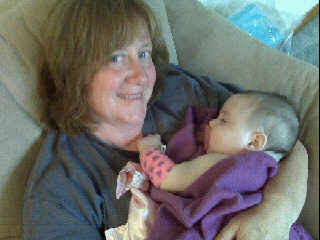 This is a picture of her holding Charlie at my mom's today while they were babysitting. So one of the main worries since we have been home is how to not have Bekah feel like she has been left out. This is especially hard because she is so intelligent. Right now she has been asking my mom or me to lay with her at night. This is hard for me for two reasons- one is because I don't want her to get into the habit of co-sleeping, and the other is I have just been SO exhausted since I have been home. 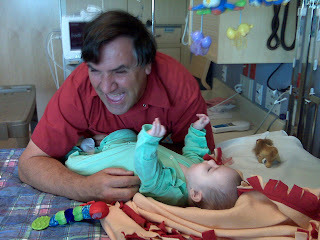 Luckily, for the fourth of July, her grandpa Mark has been spending time with her. 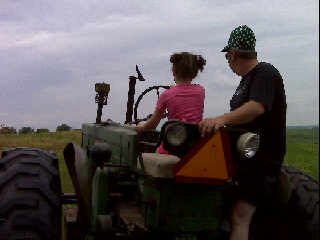 This is a picture of grandpa Mark letting her drive the tractor out at the farm for the hayride. My husband also called me during that time to tell me she was busy steering them through the bean field and then the corn field. There is a video, and as soon as I figure out how to post that on my blog, it will be up! Charlie has been doing extremely well. Now that we are home and flush her PICC by ourselves, it is really not a big deal. You are so scared in the hospital, but you don't have time to worry about getting it wrong at home. You just do it. She still has poop issues, but we don't expect it to go away any time soon. Now my focus (no matter how petty it seems) is her losing her hair. I will have to get a picture up of the hat I got for her. I am hoping it will replicated the texture of her hair because she LOVES to play with it, and it will break my heart if she reaches up to touch her hair and it is gone. 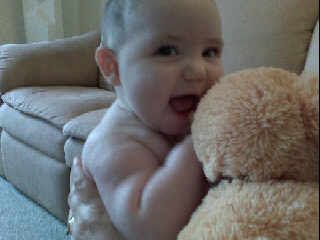 I was so excited to have a baby with so much hair (Bekah was born bald) that I have fixated on it. Here is the funny news however; in honor of Charlotte losing her hair, Kevin is going to shave his head too!! And yes...there will be pictures of that as well. May this Independence Day be one step closer to us beating this disease that I refuse to let run our lives. We are alive, and happy, and right NOW that's all that matters. Happy Fourth to you all! And welcome home! I can't wait to see Kevin with a shaved head! Not only will Charlie still be the most beautiful baby with a bald head, but the wierd thing is you never know how it will grow back in! I've seem curly haired kids grow it back straight, and dark haired kids grow it back blond! I will be working on some bows to send her way very soon I hope! I'll let you know so you can be looking for the package! Again welcome home and call me if you need anything!! !